Everything is still fine. Just fine. From the outrageous mind of Michael Schur, executive producer of Brooklyn Nine-Nine and Parks and Recreation comes the sidesplitting second season of the award-winning comedy starring Kristen Bell (Veronica Mars) and Ted Danson (Cheers). After Michael’s disastrous attempt to torture Eleanor, Chidi, Tahani and Jason for eternity goes belly-up. Eleanor and the gang are rebooted and Michael revises his plan to keep his torture subjects separate. Only now, Michael’s soul is on the line, as his boss, Shawn, won’t allow another attempt. 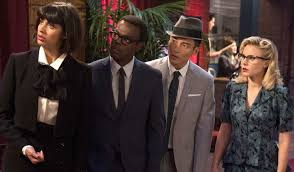 When we last left the four humans, they had just figured out they weren’t actually in “The Good Place,” but were actually in “The Bad Place.” Season two begins with the humans starting all over again in The Bad Place thinking it’s actually The Good Place. However, they quickly figure out they are in The Bad Place. Each time they figure it out, Michael rests them and everything starts all over again. However, Michael’s boss, Shawn,” thinks that all the resets are still only the second attempt at Michael’s project. Eventually, Vicky, the demon who was originally the “real Eleanor Shellstrop,” blackmails Michael, threatening to tell Shawn of all the resets unless Michael let’s her be in charge. While Vicky plans Eleanor, Chidi, Tahani, and Jason’s torture, Michael approaches them and tells them what’s going on. They agree to team up with him as long as he joins them in their ethics classes which are still being taught by Chidi. Michael agrees, but doesn’t take it seriously. He makes jokes, belittles them group, all while reminding them that he does these things because he is a demon. 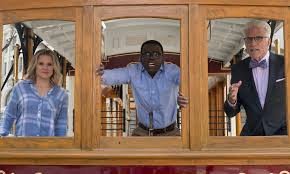 Eventually, Michael and the humans realize that they need to escape and Michael promises them that he can get them into the real Good Place, but Shawn, thinking this “Good Place” experiment is only the second attempt, proclaims it a success and orders Michael to send the humans to the real Bad Place, and destroy the fake Good Place. However, Michael helps Eleanor and the gang trick Shawn and they escape to the Bad Place offices, where Michael takes them to the Judge… the only one who can decide their new fates. After testing the gang, the Judges makes her decision and sends each member to their real place. Where do Eleanor, Chidi, Tahani, and Jason end up? What happens to Michael? Is the fake Good Place doomed? Will the Bad Placed prevail? Only season three will answer those questions… so tune in! “The Good Place” has quickly become one of my favorite shows. The writing is witty, and wonderful, and the comedic timing of Kristen Bell and Ted Danson is right on. They play well off each other, as they do with each actor in the show. I’ve watched both the first and second seasons multiple times, and each time I find myself laughing at new moments, lines, and scenes. The direction of the show is spot on, and every scene flows into the next other seamlessly, and I find it difficult to wait from week-to-week for each new episode. The transfer from television to DVD for “The Good Place” is good. The picture is clear and smooth, with no issues. Colors are bright and really pop on the screen. Special effects are done well and look realistic. I have enjoyed watching the show on both television and DVD. “The Good Place” has a good soundtrack. The Dolby Digital 5.1 audio track is well done, and the actors articulate well with no mumbling or whispering. Background sounds are at a consistent level, and there was no need for any volume adjustment once I found the level I wanted to listen at. “The Good Place” is a good show to listen to as the sound is even and consistent. Even though light on special features, I really enjoyed what was included. Gag Reel – This feature had me laughing at the mess up and bloopers from filming. Always one of my favorite features, the gag real was a good addition. Visual Effects Reel – This was a fun feature to watch. Seeing the effects brought to life really made the show seem more realistic. Extended Episodes – I enjoyed seeing the extended episodes, and seeing what didn’t make it on television. Audio Commentary – Never one of my favorites, the audio commentary wasn’t something I enjoyed. I’d rather watch the show than hear how everything happened over the audio track. As mentioned above, I have watched “The Good Place” multiple times. 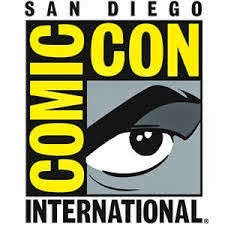 A great show to put on the television as background noise, be warned that it might be a day-changer… you will sit down and watch every episode and forget what it was you were doing to begin with. 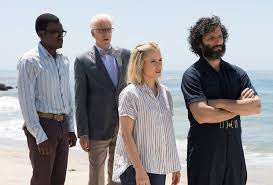 “The Good Place” has quickly become a favorite and has earned a place high on my DVR list.